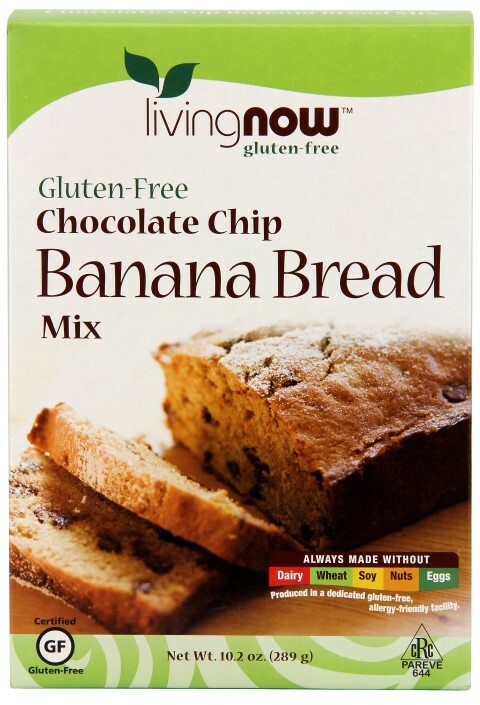 Living Now™ is more than just a brand of great-tasting gluten-free foods - it’s a way of life for anyone with food sensitivities. This premium line was developed to provide wholesome, healthy foods bursting with flavor and made without gluten and major common allergens including wheat, nuts, soy, dairy, eggs, and shellfish. Living Now™ is produced in a dedicated, allergy-friendly facility and is GMO-free with no artificial flavors, colors, or preservatives. With Living Now™ eating is safe, fun, and satisfying again! Ingredients: Organic Turbinado Sugar, Organic Brown Rice Flour, Millet Flour, Chocolate Chips (cane sugar, chocolate liquor, cocoa butter), Tapioca Flour, Arrowroot Powder, White Chia Meal, Organic Golden Flax Seed Meal, Guar Gum, Baking Powder (baking soda, monocalcium phosphate, non-gmo corn starch), Baking Soda, Sea Salt and Cinnamon. 2. Mix 3 large eggs (well beaten), 2 ripe medium bananas (mashed, approx 3/4 cup) and 2 Tbsp vegetable oil in a mixing bowl. 5. Lightly coat 9" x 4" pan with vegetable spray or oil. Then pour batter in pan. 6. Bake for 50 minutes or until a toothpick inserted into the center of the bread comes out clean. 7. Let cool for 15 minutes in pan, then remove loaf from pan and finish cooling on rack.